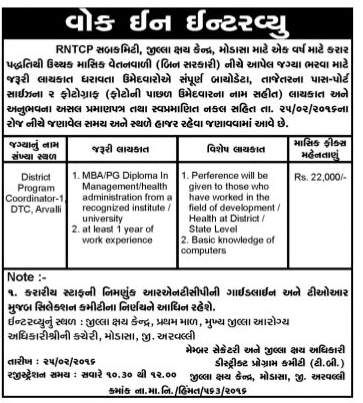 RNTCP - Modasa has published a Advertisement for below mentioned Posts 2016. Educational Qualification : MBA/PG Diploma in Management / health administration from a recognized institute / University. Al least 1 year of work exp. Venue : District T.B. Center, First Floor, Central District Health officer's office, Modasa, Arvalli.